In an absolutely stunning editorial for the New York Times, former president Jimmy Carter has publicly called for Barack Obama to divide the land of Israel at the United Nations before Inauguration Day. 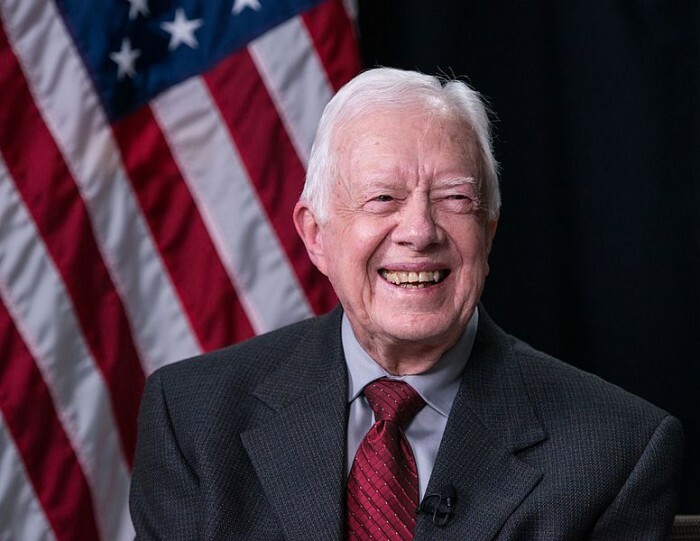 While he was president, Carter negotiated peace between Israel and Egypt, and ever since that time he has been a very strong advocate for a Palestinian state. Carter is completely convinced that a “two-state solution” will bring lasting peace to the Middle East, but now that Donald Trump has been elected Carter knows that his dream of seeing a Palestinian state while he is still alive is rapidly slipping away. In a desperate attempt to salvage the situation, Carter is urging Barack Obama to take bold action while he still has the power to do so. I am convinced that the United States can still shape the future of the Israeli-Palestinian conflict before a change in presidents, but time is very short. The simple but vital step this administration must take before its term expires on Jan. 20 is to grant American diplomatic recognition to the state of Palestine, as 137 countries have already done, and help it achieve full United Nations membership. Of course such a move would largely just be window dressing. The new Trump administration could very quickly revoke diplomatic recognition, and so if Barack Obama really wanted to “leave a legacy” in the Middle East he would have to do something that Donald Trump would not be able to undo. The Security Council should pass a resolution laying out the parameters for resolving the conflict. It should reaffirm the illegality of all Israeli settlements beyond the 1967 borders, while leaving open the possibility that the parties could negotiate modifications. Security guarantees for both Israel and Palestine are imperative, and the resolution must acknowledge the right of both the states of Israel and Palestine to live in peace and security. Further measures should include the demilitarization of the Palestinian state, and a possible peacekeeping force under the auspices of the United Nations. Such a UN Security Council resolution would be considered legally binding on the Israelis and the Palestinians. And the Trump administration would not be able to undo such a resolution because it would take another vote of the UN Security Council to revoke the resolution once it had been passed and that would not happen. Right now the rest of the UN Security Council is ready to support this kind of resolution. The only thing that has been standing in the way has been the U.S. Security Council veto power, and there have already been rumblings that Obama may not exercise that veto power if a “parameters resolution” is put up for a vote before he leaves office. And if Obama was going to make such a move, a really good way to drum up some public support for it would be to have a highly respected former president publish an editorial supporting the move in a highly visible newspaper such as the New York Times. As Carter’s criticism of Israel over the years has become increasingly scathing and one-sided, Jerusalem’s policy has been to largely ignore him. In line with this approach, neither the Prime Minister’s Office nor the Foreign Ministry had any response on Tuesday to his op-ed. A number of European governments, as well as various think tanks, are talking with Obama administration officials, urging them to take some kind of action on the Israeli-Palestinian conflict in the waning days of the current presidency. Among the suggestions are a new UN resolution laying down parameters for a peace deal; US support for the recognition of “Palestine” in the UN; or – at the very least – backing or abstaining on an anti-settlement resolution in the Security Council. Israeli officials consistently maintain that they do not know what – if anything – Obama has planned. However, the fact that Prime Minister Benjamin Netanyahu continuously says – as he did on Sunday – that he expects Obama not to divert from traditional US policy on the matter, is an indication that there remains concern over the matter in Jerusalem. From a Bible prophecy perspective, the division of the land of Israel is the number one event that we are watching for right now, and this is one of the reasons why I have labeled the period of time leading up to January 20th as “the danger zone“. There have been many that have warned that once we divide the land of Israel, our land will be divided as well. But in addition to the great earthquake that is coming to the center of our country, we also know that so many of the other major judgments that I warn about in The Rapture Verdict come after the land of Israel gets divided. But even though the New York Times and the Wall Street Journal have both been running stories about a potential UN Security Council resolution that would divide the land of Israel, and even though experienced politicians such as Jimmy Carter and John Bolton are making lots of noise about it, most people don’t seem to understand how immensely important this really is in the greater scheme of things. But if Barack Obama does decide to make a move to divide the land of Israel at the United Nations at some point during the next several weeks, the consequences for this nation will be more severe than most people would dare to imagine. Previous articleTurkey Has Declared War On Syria – Does This Mean That World War 3 Is About To Erupt In The Middle East?